Deborah Thomas, Ph.D. New York University 2000, is a Caribbeanist whose research focuses on the changing relationships among the political and cultural dimensions of nationalism, globalization, and popular culture. She is interested in the ways a changing global political economy structures and restructures the ways people of African descent think about, experience, represent, and mobilize around racial, class, national, gender, and generational identities. 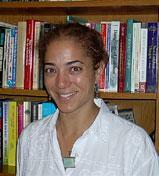 Her book, Modern Blackness: Nationalism, Globalization, and the Politics of Culture in Jamaica, was published by Duke University Press in November 2004. Dr. Thomas is currently working on a new project focusing on a contract labor program, developed by the Jamaican Ministry of Labour, that sponsors the seasonal migration of Jamaican women for work in hotels throughout the United States. Prior to her life as an academic, she was a professional dancer with the New York-based Urban Bush Women. She has also been a Program Director with the National Council for Research on Women, an international working alliance of women’s research and policy centers whose mission is to enhance the connections among research, policy analysis, advocacy, and innovative programming on behalf of women and girls. D.A. Thomas. "Subaltern Politics in Jamaica: A Review Essay of Obika Gray’s Demeaned but Empowered: The Social Power of the Urban Poor in Jamaica." Social and Economic Studies ( March, 2006.). D.A. Thomas. "Review of Callaloo Nation: Metaphors of Race and Religious Identity among South Asians in Trinidad." American Anthropologist vol. 108 no. 1 ( 2006.). D.A. Thomas. "“Development, ‘Culture,’ and the Promise of Modern Progress”." Social and Economic Studies (December, 2005). D.A. Thomas. ""Transcending the Limits of Politicsl and Intellectual Boundaries: A Review of Charles V. Carnegie's Postnationalism Prefigured: Caribbean Borderlands."." World Order vol. 34 no. 4 ( 2004): 9-20. D.A. Thomas. "“Politics Beyond Boundaries: A Review Essay of Current Works on Nationalism, Migration, and Cultural Production within the Black Atlantic World.”." Identities vol. 11 no. 2 ( 2004): 265-283.